Note: Data are preliminary. Barged coal percentages are based on primary mode of transportation only. Louisiana, Arkansas, and Illinois reported no coal deliveries with River barge as the predominant mode of transportation. Days-of-burn is a forward-looking projection based on monthly consumption trends. In the case of Louisiana and Mississippi, the two States' days-of-burn data are combined. Data for Tennessee also include coal storage terminal receipts. Flooding along the Mississippi and Ohio Rivers in late April and early May disrupted barge traffic in some areas, resulting in delayed coal deliveries to power plants. 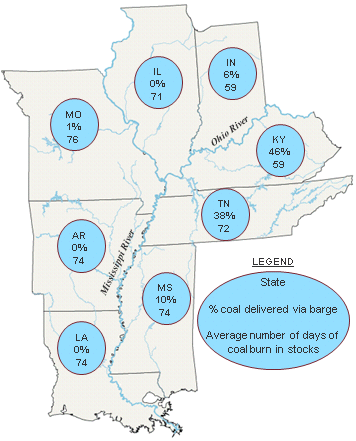 However, reliance on barge transportation for coal supplies varies by power plant and by State. Moreover, power plant operators in States affected by recent flooding (shown on the map) have on average between 59 to 76 days of coal supply in their stockpiles. Among States in the flooded areas, Kentucky and Tennessee are the most dependent on barge transportation, accounting for about 46% and 38% of their overall coal supply needs. By contrast, power plant operators in other States affected by flooding rely primarily on rail and/or truck deliveries of coal. Many companies rely on multiple modes of transportation to get delivered coal. Barge traffic disruptions have not resulted in material coal supply issues yet because coal-fired power plants maintain an inventory of coal in stockpiles, or may be able to get replacement coal via rail or truck. As of March 31, 2011, EIA estimates that coal-fired power plants in States identified in the map had an average of a two-to-three month supply of coal on hand.